Digital Lifescapes: Microsoft and Intel - Another "New Era in Computing"
Microsoft and Intel - Another "New Era in Computing"
While much of the prior demand for media tablets was for personal use at home, usage is now increasing rapidly in the workplace -- threatening to disrupt the traditional players. Other changes in the marketplace, such as the disappointing results for Ultrabook PC sales, are forcing Microsoft and Intel to rethink their market development strategy. The two legacy PC market players have chosen to promote 2-in-1 devices -- a Windows 8 tablet with detachable keyboard -- in the hope that they gain traction in the workplace. They will likely target these devices at CIOs and IT managers that are at odds with their employee's Bring Your Own Device (BYOD) policy demands. Both companies have briefed industry analysts about their new strategy, with the expectation that their forecasts of 2-in-1 demand and adoption could eventually result in meaningful new sales for these expensive Windows 8 devices. Only time will tell if this approach will produce the desired outcome for Microsoft and Intel. 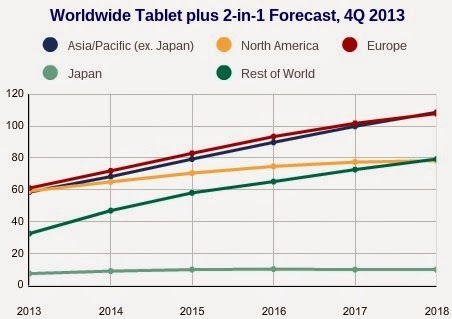 According to the International Data Corporation (IDC), the total tablet market -- inclusive of both tablets and 2-in-1 devices -- is forecast to grow 19.4 percent in 2014, that's down from a growth rate of 51.6 percent in 2013. IDC reduced the 2014 forecast by -3.6 percent from its previous projection to 260.9 million units worldwide. The reduction in the short-term forecast was due to slowing consumer purchases as hardware iterations slow and the installed base -- particularly in mature markets -- continues to grow. Over the course of the past two years average selling prices (ASPs) have declined rapidly in the tablet market, but this too appears to be slowing. In 2012, ASPs declined -18.3 percent from the previous year, and in 2013 prices dropped another -14.6 percent. Price erosion has started to slowly bottom out, with ASPs forecast to drop a modest -3.6 percent in 2014. IDC believes ASP declines will slow for several reasons; chief among them are the growth of higher-priced commercial shipments and a consumer movement away from ultra-low cost products. "After years of strong growth, we expect the white-box tablet market to slow in 2014 as consumers move to higher-end devices that work better and last longer," said Tom Mainelli, vice president at IDC. In mature markets, where many buyers have purchased higher-end products from market leaders, consumers are deciding that their current tablets are good enough for the way they use them. Few are feeling compelled to upgrade the same way they did in years past, and that's having an impact on growth rates. As consumer shipments slow in many markets, commercial shipments will grow as a percentage of the overall mix. Much of the tablet growth in commercial to date has been in verticals such as education, but going forward IDC expects tablets to continue to infiltrate small, medium, and large businesses around the world. This commercial growth may benefit Microsoft Windows devices, over time. However, the availability of useful productivity software may be a gating factor -- by far, most tablet apps are developed for the Apple iOS and Google Android platforms. "The choice of operating system will be a key differentiating factor when it comes to success in the commercial segment," said Jitesh Ubrani, research analyst at IDC. "Though Android and iOS will remain dominant, we expect Windows-based devices to capture more than a quarter of the market as its benefits become apparent thanks to growing adoption of 2-in-1 tablets." I'd anticipate a similar "New Era in Computing" advertising campaign from Intel and Microsoft, like they did for the Ultrabook launch. In the past, Intel reportedly spent "hundreds of millions" of dollars in its unsuccessful attempt to influence more people to buy these very expensive Wintel notebook PCs.